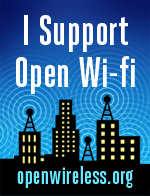 Open Wireless Advocates to European Court: Don't Make Us Lock Down Our Networks! Can the FCC Create Public "Super WiFi Networks"? Since the Open Wireless Movement launched last month, we have received a lot of excited responses and helpful feedback. It's clear that the conversation about a world of open wireless was waiting to be reinvigorated. Cross-posted from the Open Garden Foundation blog. For decades, it has not been possible to have open communications systems on the physical level. In a world of wires, network access meant physical access. Wireless networking enabled the technical possibility of a completely open network. Cross-posted from the Engine blog. Cross-posted from the Open Media International blog. Imagine a world where your wireless network is open and available to all, and where such openness is seen as basic politeness – the equivalent of providing a guest with a hot cup of tea. Cross-posted from the Open Technology Institute blog. Last week, a coalition of Internet rights groups launched the Open Wireless Movement, a new project which will promote shared wireless Internet access. The Open Technology Institute and OTI's Open Internet Tools Project are two of the ten groups in this coalition.